More than 3,000 have already signed up to run the Streets, including many Irish internationals and top club runners, as well as thousands of Galwegians and visitors who take part every year. This year another strong field will line up at the starting tape with numerous Irish internationals entered. Among the favourites is the current National 1500m champion, John Travers of Donore Harriers, last year’s winner Kevin Maunsell of Clonmel AC, Hugh Armstrong of Ballina AC, and Rory Chesser of Ennis Track AC. Others to watch include Eoghan Totten of Newcastle AC and Andrew Annett of North Belfast Harriers, while the top local athletes Brendan McDonnell, Neill Keane and Talon Thompson of GCH will have their eye on the team prize. In the women's section, multiple winner Siobhan O'Doherty of Borrisokane AC returns, in addition to last year's podium finishers, Caroline Crowley of Crusaders and Nicola Duncan of Galway City Harriers. Orla Drumm, also of Crusaders, is also expected to feature among the top group, while local interest lies with Regina Casey and Barbara Dunne of GCH, and Jane Ann Meehan of Athenry AC. The spread of athletes will come from many of Ireland's top clubs, including Crusaders and Liffey Valley from Dublin, Mallow AC in Cork, Finn Valley AC from Donegal, Ennis Track AC in Clare and, of course, all of the Galway clubs will be well represented. 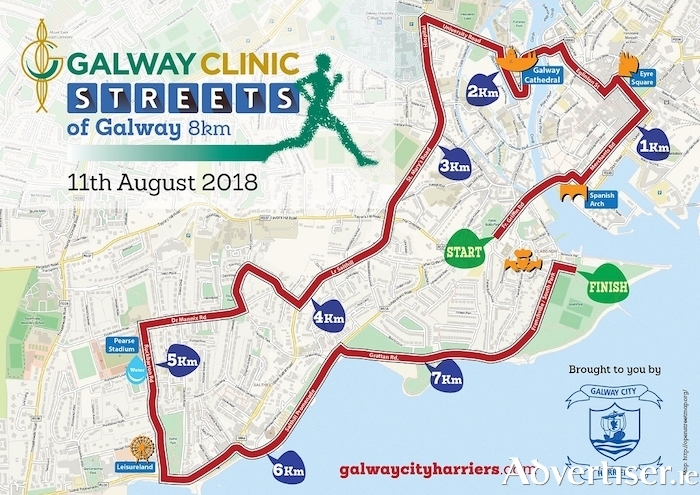 Organised by local athletics club Galway City Harriers AC and sponsored by the Galway Clinic, the race takes place on Saturday August 11 at 7pm, with the start at GTI on Fr Griffin Road. The race route takes in the city centre, Salthill and the Claddagh, before finishing at South Park. Race packs, which include a T-shirt, and number with timing chip, can be collected at race headquarters at The Claddagh Hall, South Park, Salthill, Galway at the following times: 2pm to 8pm tomorrow, and 9am to 4pm on race-day. Rising star Robert McDonnell of Galway City Harriers ran with the Irish relay squad at the Celtic Games in Scotland on Saturday, and claimed bronze in the 4 x 400m relay.